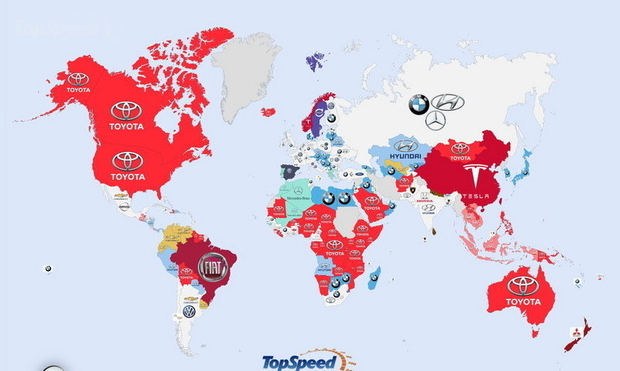 The most frequently googled brands of cars by country, globally. Chinese love their cars. With the emergence of a large middle class, and in spite of restrictions on daily car use in some cities, many Chinese households are choosing to keep a second and sometimes even a third automobile. The world’s most populous nation (currently at 1.38 billion people and climbing) has transformed itself from the Bicycle Kingdom of my youth into a People’s Republic of Cars. Based on the latest numbers from China’s Ministry of Public Security, China had 172 million light duty vehicles by the end of 2015—that’s one car for roughly every eight people. If we factor in trucks and other types of heavier vehicles, China has an overall fleet of about 279 million, or one car for every five people. By comparison, the United States, with a population a fraction of the size (324 million people), has about 250 million vehicles, or one car for every 1.3 people. What is more than a little scary is what that means for all of us in the future. 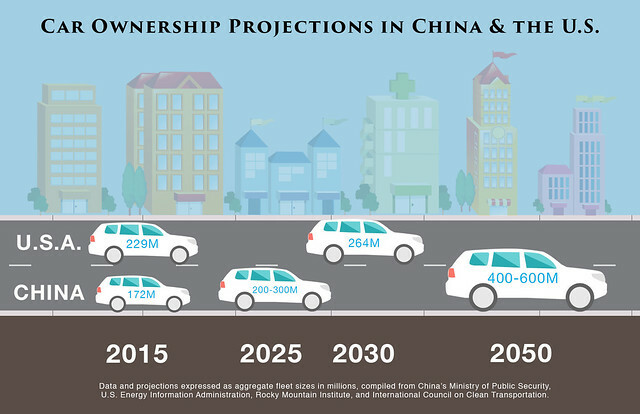 The Rocky Mountain Institute projects that China will have 400-600 million cars by 2050—a fleet roughly twice the size of the current U.S. fleet. Yet even at a number that high, Chinese car ownership would still be far lower per capita than American car ownership. All too aware of the increase in greenhouse gas emissions contributed by its growing fleet, China has set very high ambitions for developing electric vehicles and increasing cumulative electric vehicle sales from fewer than 280,000 now (as estimated by The International Council on Clean Transportation (ICCT)) to 14 million by 2025. By comparison, the U.S. aims to grow its electric vehicle fleet from around 400,000 now (as estimated by ICCT) to 3.3 million by 2025 (for eight states). China’s 2025 target is very ambitious, but not impossible. Given the tremendous progress in the renewable energy sector, I think it is likely that China will soon become the world’s largest electric vehicle market and continue leading the way to greener transportation. Even though China has set an ambitious goal, there’s no room for complacency, as 14 million electric vehicles (EVs) would account for less than 10 percent of China’s current total fleet size—and, if projections come true, would only account for five to seven percent of the fleet in 2025. Recent statistics indicate that China is well on its way to realizing its goal. In total, more than 330,000 “new energy vehicles” were sold in China in 2015, including all-electric, plug-in hybrid, and hydrogen fuel-cell cars. That’s more than a threefold increase from the previous year. With this surge, China has overtaken the U.S. to become the world’s largest market for electric vehicles. We should also note that the surge was in large part due to the explosive growth of low-speed EVs in less developed cities, many of which are Smart Car-sized cousins of full-size EVs that the government is expected to regulate soon. Of course, an electric car is worthless without electricity. In May 2015, Vice Premier Ma Kai said that China’s shortage of EV charging stations was stifling the development of an industry into which the nation already has invested billions to solve the problem. According to China’s state-run news agency Xinhua, China expects to build a big network of charging stations for the future growth of the electric car market. By 2020, the country wants to have 4.8 million new charging stations, accommodating over five million new energy vehicles, including 4.3 million EVs. In a recent video, Bjorn Lomborg, President of Copenhagen Consensus Center, lashes out at the electric car for not being environmentally friendly. According to Lomborg, one third of an EV’s lifetime emissions are produced during its production, and the manufacture of an EV is substantially dirtier than making a comparable conventional vehicle production—25,000 pounds of CO2 for each EV, versus only 16,000 lbs of CO2 for each gasoline-powered car. We talked to an expert, Jonathan Walker of the Rocky Mountain Institute, who pointed out many of the flaws in the arguments against electric vehicles. Under Lomborg’s premise that one-third of an EV’s lifetime emissions are produced during its manufacture, he assumes that the vehicle will forever be powered by a coal-intense grid and not drive more than 90,000 miles. Walker points out that charging the EV from a 100 percent renewable-energy grid, however, would mean that 100 percent of its emissions are produced during its manufacture, not just 33 percent. Using these stats, EVs save only three to five tons of CO2 over their lifetimes. In Europe, Lomborg points out, one ton of CO2 is worth $7 on the carbon market, so an electric car only saves about $35. But U.S. tax subsidies are $7,500 for an EV, plus benefits to battery and car manufacturers. Why pay $7,500 for something you can get for $35, Lomborg asks. EVs will long remain a dirtier form of transportation than conventional vehicles, Lomborg says, because energy generated from renewables is not projected to increase by a very large amount. But Walker counters that “even the most conservative of conservative analysts would laugh at this projection.” The U.S. will be sourcing “well over 50 percent [of its energy from renewable sources] by 2040 and the remainder should be much cleaner than coal,” Walker said. —David O’Connor contributed research and writing.